An iconic but long-neglected courthouse in the South Bronx that once housed prisoners and a coroner’s office will be transformed into a high school as the city’s largest charter school network expands in the borough. 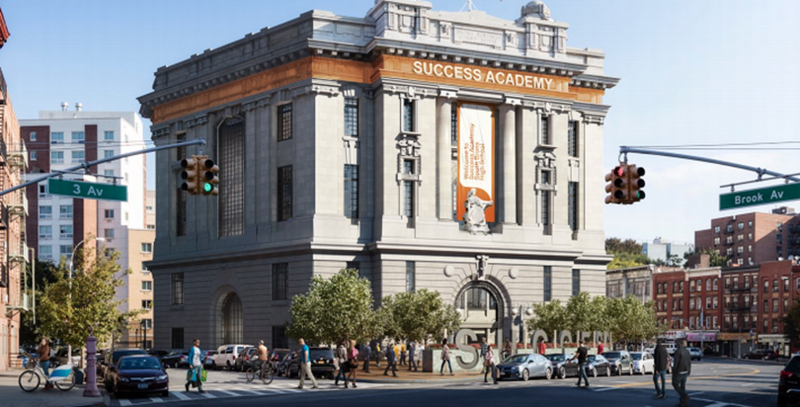 Success Academy officials announced Monday the network will lease the nine-story, 113,000-square-foot building at 878 Brook Ave. to serve as its first high school in the Bronx and the second high school in the network. The school will be called Success Academy High School of the Liberal Arts–Bronx (the Success Academy High School of the Liberal Arts on East 33rd Street in Manhattan opened in 2014) and is expected to open in August 2018, eventually serving about 1,200 students, officials said in a statement. The network currently serves 14,000 students, mostly low-income children of color, in 41 schools throughout the city, including six elementary and middle schools in the Bronx. Planned renovations will both restore the historic elements of the building and outfit the interior as a modern high school, including a fabrication lab for science and computer programming, gallery spaces for displaying student work, and a college-style lecture hall, officials said. 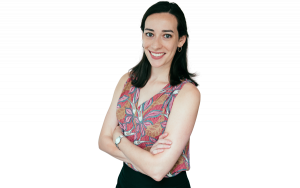 The project is funded largely with the help of philanthropists Jenny and John Paulson and the Paulson Family Foundation. 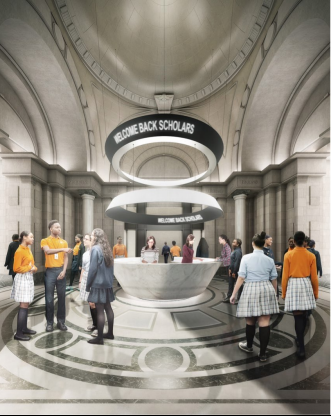 The Paulsons earlier gave $8.5 million to the network, some of which will go toward the new school, a Success spokeswoman said. The remainder of the costs will be split between the network and the landlord, Liberty Square Realty, but were not disclosed. The stately Beaux Arts structure known as the Old Bronx Borough Courthouse was built between 1905 and 1914, but the city relocated most services to a newly built location in the 1930s, beginning a long period of decline, according to Success Academy. The building has been largely vacant since about 1978, with the exception of serving as the backdrop for film and television shoots. It housed a recent art exhibition that celebrated the landmark site. Liberty Square Realty Corp. bought the building at an auction for $300,000 in the late 1990s, developer Henry Weinstein told The Wall Street Journal. Weinstein and his partner Benjamin Klein have since spent $10 million in clean-up and repairs, the Journal reported. In the last pwo decades, the owners have reportedly turned down potential tenants including fitness clubs, banks, and a storage facility. Another charter school network, the Virginia-based Imagine Schools, nearly closed a deal to lease the space in 2008. Negotiations apparently fell through after it became clear to the network that renovations would take longer than expected, The New York Times reported. Disclosure: 74 board member Campbell Brown also sits on the board of Success Academy.